In this post I begin to unpack what innovation means to me in the context of learning; I need to develop a personal working definition of innovation for my Online Education course. I have spent a lifetime teaching people about the creative process and looking at innovation as the output of the psychology of creativity. From a traditional academic perspective I could write and have written a great deal about creativity and innovation. The theories, the practice and application have accompanied me throughout my career. This latest assignment is asking for a working definition that will enable me to evaluate if a particular technological achievement can be called an innovation. It asks less for a theoretical endeavour and more for an exploration situated in my context of operation. The paper I quote at the start of this post is not looking at innovation in learning in the ways above, it seems to be more focussed on the creation of new artefacts for learning that use what is now mainstream Web 2.0 tools. It also looks at how participation is made more sophisticated and distributed by the availability of these tools. Different initiatives can come together to create a ‘perfect storm of opportunity’ for the creation of an ‘open participatory ecosystem’ for learning – of which perhaps the P2PU is a seedling example. I have found the idea of ‘purposeful tinkerings’ the most useful summary of what innovation means to me. I agree with Seely Brown that our educational system seems to have evolved to discourage tinkering and that ‘tinkering has now migrated to internet’ – kids now tinker virtually rather than in the garage with dad. In a lecture I watched at his website, Seely Brown comments that even if you want to tinker with cars in real life these days, you are discouraged to do so because it may void your warranty. This made me think that so much of what we do in life, school and work creates the illusion of a fixed and final output. Seely Brown says that in order to innovate and learn in new ways we need to learn to fail and fail and fail again and that we are not encouraging our youngsters to learn the value of this mode of being – I call it how to fail splendidly. Yet, human beings have found a way to keep developing this tinkering ability online. There is no sense of permanence there, and Martin Weller tells us that in order to become digital scholars we need to adapt to the ephemeral nature of what we write online. Seely Brown adds we need to adapt further and expand our notion of who owns ideas. A model that encourage creation, use, reuse by multiple agencies does not easily lend itself to traditional intellectual property rights. Our notions of ownership are challenged by the music mashup or the threaded blog discussion – who owns what? This takes me to a more theoretical aspect of creativity and innovation. 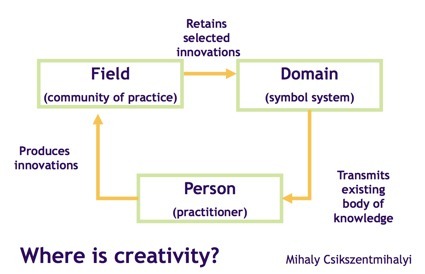 Mihaly Csikszentmihalyi (in Sternberg 1999) has made what I consider to be a seminal contribution to the debate by developing a systems theory of creativity. The original paper has been unpacked in many of his later writing but I want to offer the original drawing as a way to help our dialogue and explain what I think is key to any definition of innovation. We often hold an outdated notion that the ability to be creative to innovate in the world is something that is about individual talent. Csikszentmihalyi asks a much needed and important question: Where is creativity? If we take as given for now that creativity is the process whereby innovations are produced for use by a group of people then we can see that that in asking where rather than what our attention get taken to location rather than explanation. The theory holds that we need to locate the individual within the system that is the creative process. An individual practitioner can only produce an innovation if it is recognised as such by a community of practice, the gatekeepers to a given domain of knowledge. These gatekeepers evaluate innovations and only ones that meet certain criteria are retained into the domain (the knowledge, tools, values and practices of a discipline) and this domain is always part of a larger cultural system. Indeed a field of experts also belongs to a larger social system as an individual practitioner belongs to a larger genetic pool of talent and experience. I think the article is worth a careful read and I find it invaluable in discussing definitions of creativity and innovation in my work. Coming back to how we define innovation in e-learning to enable dialogue and collaboration on a Masters in Online education, I agree with Seely Brown in that tinkering now happens online. Weller tells us that digital scholarship has changed the nature of writing and collaboration. We can now write collectively. We can, for example, be in the middle of writing a chapter and ask our network for live examples to include in that chapter, we can put up unfinished chapters and ideas for peer review and discussion on our blogs. Where is the innovation? It is not in the practitioner who created the technology, it is not in the community of practice that adopted the innovation, it is not in the tool itself or the ground rules that are used to interact in the given domain. All of these elements interact to give us an innovation in the field of academic writing. The purposeful tinkerings of an individual and small group, become something that can be used by a larger group, and (if it works) gets adopted by that group and other groups. Once it has been adopted into the mainstream, our language changes to absorb the innovation into the mainstream – as when we ‘poke’ our friends in Facebook, or when blogs ( web + log) become a research tool that enable a different type of dialogue between academics. Language reflects the adoption into the mainstream of what was once an innovation as it is slowly adopted by a cultural system. We add new words to our dictionaries. 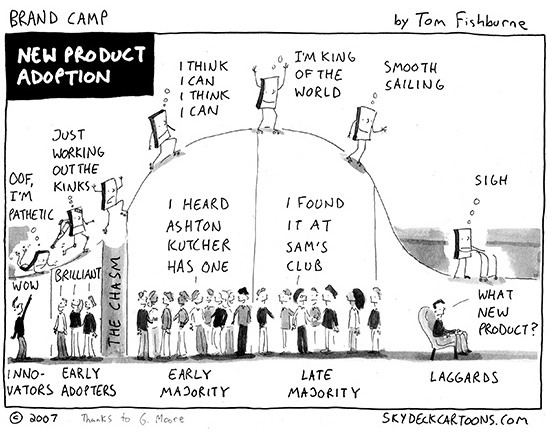 Using the Roger’s bell curve, as the late majority and laggards adopt a given technology into the mainstream it is likely that innovators and early adopters have moved on to pastures new. I am finding this as I come back into technology after an absence of several years. Technology that in my days as an artificial intelligence researcher was leading edge is now used as standard by all. The diffusion of innovation curve tells us that when looking at online education the use of Second Life and other MUVEs may count as an innovation but the use of Twitter for education may not as it is a technology that is now adopted even by the late majority. Yet, I think that Twiducate is an innovation for a context. Twitter may be mainstream for most, but teachers can still remember a time when its use in the classroom was not allowed. So, is the adoption of a mainstream platform into a new domain an innovation? Where is innovation in online learning? Is any purposeful tinkering online for use in education an innovation? Are educational technologists the knowledge engineers of today, solutions looking for problems? Is love for technology a prerequisite for the adoption of a given innovation? Are we creating a multi-tier learning world, where only those with computational literacy can expect exponential learning? Is exponential learning something we should unquestioningly be aspiring to? Perhaps over the next few months as I learn more, I may get these musings into the kind of shape that is worthy of publication in an old fashioned journal. For now I will just take these questions into my online tinkerings.